Looks like we are in for near-perfect conditions for our Sunday distance run! Come on out for some quality miles with your running buds, and cap it off with coffee and socializing at Dean & Deluca after. Variable pace groups (7:00 – 10:00) and distances (8-20 mi). Finally, remember our (4th?) 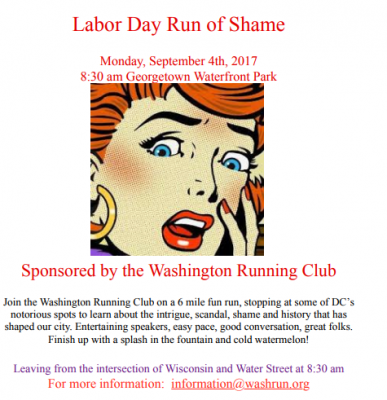 annual Labor Day Run of Shame, taking place on Monday, Sept. 4 (so, two Mondays hence) at the Georgetown Waterfront. See flyer below. This is always a blast and has proven a great WRC recruiting event as well. Plan on coming out to participate and be an ambassador for the club—try and bring a friend! It looks like we may catch yet another break weather-wise, as Sunday morning looks to be the best running morning of the week. As always, we’ll be in front of CB2 at 7:00 am, and then at Dean & Deluca for coffee at around 8:30. Please drop by, and bring a friend or two. Join the Washington Running Club on a 6 mile fun run, stopping at some of DC’s notorious spots to learn about the intrigue, scandal, shame, and history that has shaped our city. Entertaining speakers, easy pace, good conversation, great folks. Finish up with a splash in the fountain and cold watermelon! Monday, September 4th 2017. Leaving from the intersection of Wisconsin and Water Street at 8:30 am. Our Sunday social run is tomorrow morning at 7 am by the CB2 in Georgetown. A few of us will meet at 6:05 am for an early six miles. Please join us! We’re in store for another unseasonably comfortable Sunday morning this week, so join us for our weekly group run. We will meet at 7:00 am in front of the CB2, Georgetown, for our monthly group photo and then enjoy the many benefits of exercise. Coffee and conversation will follow. If you’re interested in six or seven bonus miles, a few of us will meet at 6:00 am at the CB2 for extra credit. Also, mark your calendar for our annual September 4 “Labor Day Run of Shame.” It’s the high point of the WRC year, so plan to be there. Details to follow.